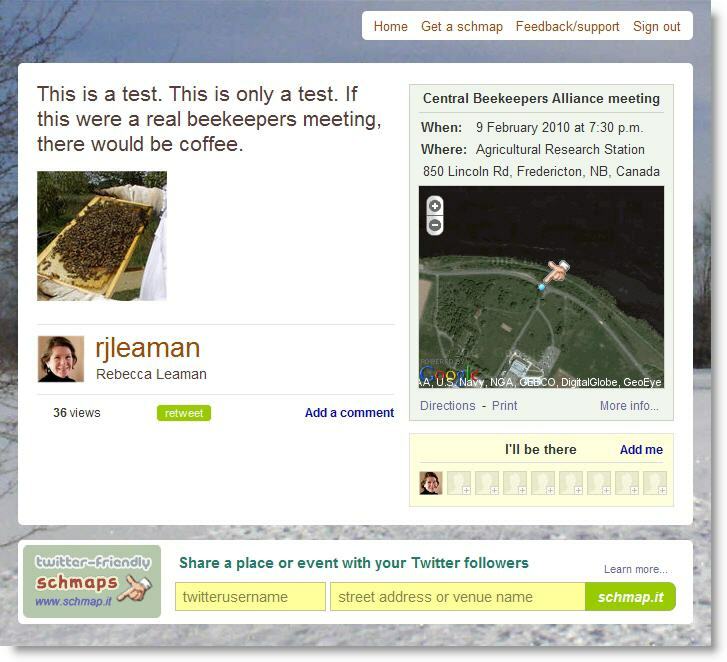 Do you use Twitter to remind your members of a meeting or fundraising event? Here's a free tool that easily creates a special map to go with your tweet, to help people find your event. Twitter users can even RSVP or add a comment, if you choose to allow those options. Visit the Schmap.it website, and enter your Twitter username and the street address of your event -- no need to register or to login. Schmap It pulls a map from Google and then gives you a chance to make any corrections needed to get the address right. You can also zoom and pan the map, change Map/Satellite and drag the map icon to adjust its position, just as you’re probably used to doing with Google Maps already. When you’re happy with your changes, click “Save” — and you’ll be given a custom URL for your map page. Ready to promote your event on Twitter? Just click the “Tweet” button. You’ll be taken to the Twitter website (login if you’re not already logged in) and the update text field will be prepopulated with details of your event. Edit the wording, if you want to change anything there, and send out your tweet as usual. When followers click on the link in your tweet, they’ll be able to see the map page you’ve just created — and to RSVP or comment, if you’ve enabled those options. When you visit the event map page you’ve created, you have the option to sign in (using your Twitter username and password) to edit or delete your "schmaps" and track metrics including the number of views, retweets, comments and attendees. I’d prefer to see Schmap It using OAuth or similar for your login, rather than asking for your Twitter credentials. (It’s just a matter of good security practice, to avoid giving your login information to any third-party site.) But that’s not a deal-breaker — no login is required to create a map page, and views, retweets, comments and attendees are shown on your event map page anyway. So you’d only ever really need to login to Schmap.it if you wanted to edit or delete a map page you’ve created. The real stumbling block is on the receiving end, however. Anyone who wants to comment or RSVP will need to login with their Twitter name and password to do so — and that’s far from ideal for sharing the link with non-users of Twitter, as well as from the security standpoint. Bottom line: we’re certainly not looking at a replacement for a proper event registration system here. Still, as a cool, fun, free way to add a bit of pizazz to your Twitter event notices, Schmap.it can be a useful addition to your nonprofit’s online toolbox. What Twitter tools do you use to help promote your nonprofit's events? I have tried for 2 days to upload an event thru Schmap It, but I just get a message that "this service is temporarily unavailable." Anyone else having the same problem???? It's been working fine for me, Beth... Any chance you're behind a firewall that may be blocking? If not, I'd suggest you send a quick tweet to @schmap on Twitter http://twitter.com/schmap to see if they have any other users experiencing the same thing. Fantastic share, thanks for this resource. This is a really cool application! Thanks so much for sharing this tool....I'm going to use it right now.